Shah Qasim Sulaimani was a saint of great fame during the reigns of Akbar and Jahangir. The latter suspected him of favouring the claims to the throne of his son Khusrau, and imprisoned him in the fortress of Chunar in 1606 where he died the following year. His tomb is half a mile south-west of the fort. 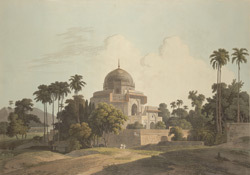 The domed unadorned tomb is elevated on a broad terrace with sandstone screen carvings.